Ekaterina Mortensen was born and educated in Leningrad (now St Petersburg), Russia. She migrated to Australia in 2000 to marry Alex and lives with him in Quialigo, NSW. From childhood she had a strong interest and a proven ability in art that developed further when she was employed as a graphic designer in publishing of high quality art books in the State Russian Museum - the second largest art gallery in St Petersburg after the Hermitage. Ekaterina's exhibitions display her versatility and interest in Australian nature. These have included flowers, birds, various animals and insects, as well as landscapes and portraits. She has held several solo exhibitions in Goulburn and the Illawarra, joint exhibitions in Sydney, participated in numerous group exhibitions in Sydney (Real Refuses), Goulburn, Austinmer, Wollongong, Gosford and Queanbeyan. She has entered works numerous times in the GRAG Art Award and each year in the Goulburn Annual Art Prize. 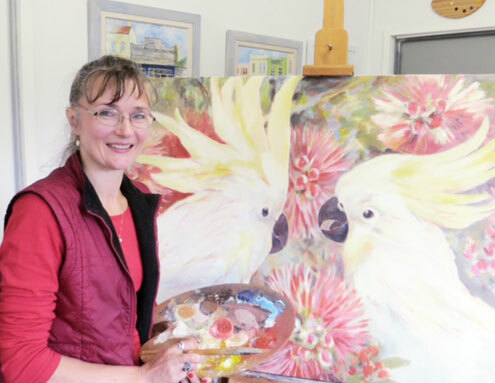 Ekaterina entered the Archibald four times, exhibits in the Sydney Easter Show, the Canberra Royal Show and has exhibited in the Sun Herald Rotary Show at Camberwell a few times. In 2006 she was published in Artist's Palette magazine including the demonstration article. Deep devotion to fine art and a desire to develop more in this area brought Ekaterina to study Bachelor of Fine Art (Curtain University) online and she graduated in 2015. During her artistic career in Australia, Ekaterina has produced over 500 works, and has sold approximately a third of them at exhibitions, privately or by commission. She has paintings hanging in a private collection, in a medical clinic and a legal firm in Goulburn and in the American Embassy in Canberra; in various Australian states, UK, USA, Canada, Russia and Germany. Ekaterina promotes her works on the Internet through her own website Katya's Art, as well as on FineArtsAmerica and OzArtFinder websites. In 2014 Ekaterina was nominated for the Goulburn's Australian of the Year Award 2014 for her achievements in art and "injecting cultural diversity and artistic talent into the local community" (The Post Weekly, January 16, 2014). © Ekaterina Mortensen 2019. All Rights Reserved.